Installs a new 'Coordinates' attribute for latitude, longitude and altitude. 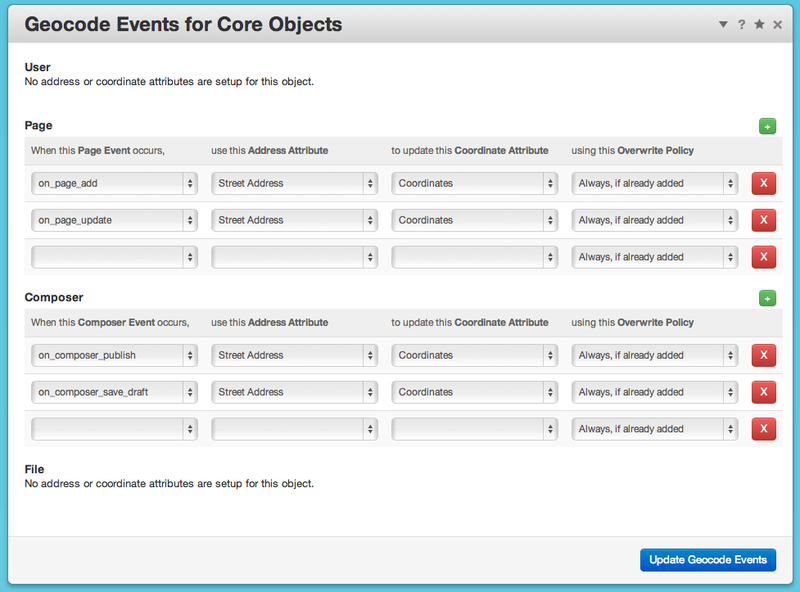 Out-of-the-box functionality to automatically update geocode attributes for User, File, Page and Composer based on an address attribute on the same object during selected events, such as 'on_page_load' or 'on_page_update'. Custom objects are also supported. The same basic automatic updates can also be done using reverse geocoding (taking a coordinate and turning it into an address). 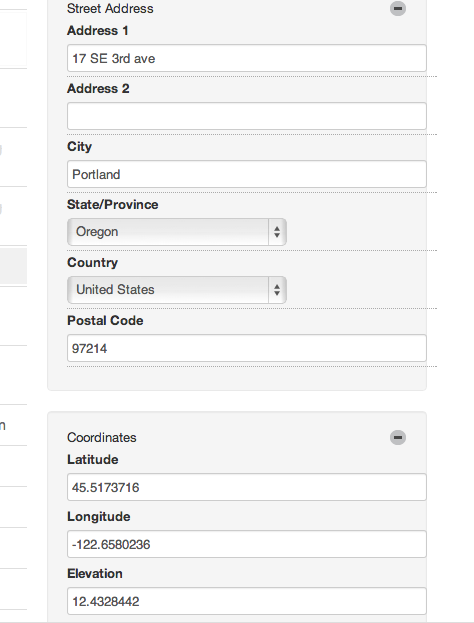 So if you use browser geocoding to gather a coordinate, you can save the address as an attribute on that object. Always, create if needed. When the address attribute is updated the coordinates attribute will updated or created, as necessary. Always, if already added. When the address attribute is updated the coordinates attribute will also be updated, but only if it has been manually added already. If empty, create if needed. When the address attribute is updated the coordinates attribute will updated or created, as necessary, but only if the coordinates attribute is empty. If the coordinates attribute has already been set, it won't get updated. If empty, but already added. When the address attribute is updated the coordinates attribute will also be updated, but only if it has been manually added already and it is empty. A version of this addon for 5.7+ is available here.